This article discusses Disney’s additional investment into virtual reality (VR) entertainment after the release of their first VR short film “Cycles.” This investment shows Disney’s commitment to further exploring the technology and how it might change the way they provide entertainment. In an interview commenting on this article, Ben Fox Rubin summarizes the VR industry with the “chicken or the egg” analogy. I found this to be a very interesting and appropriate comparison. At this point, VR technology has been available for a few years, yet there has not been as much adoption as you might expect. A lot of people are waiting for worthwhile content to be available on VR before they buy headsets and the content creators are waiting for people to purchase VR gear before they invest in creating entertainment. This, I believe, is why there is not widespread consumer adoption of VR technology. More firms like Disney need to provide a collection of content significant enough to drive consumers to purchase the gear. I think if Disney makes this move, it could provide them a first-mover advantage. Especially if they pair it with the new streaming platform Disney+ they are working on. Do you think VR is the next big thing in the entertainment industry? If so, why do you think it hasn’t seen widespread adoption? If not, why do you think it will fail? This is a great example of VR business application! This reminds me of the success of 3D movies with the 3D glasses in that people are looking for more realistic film experience. However, it has some risks that unlike going to the theater to see a 3D movie is a social experience, watching a movie with a VR set is more of something you do alone. It’ll be very interesting to see how Disney plan to grow the VR market. I think VR will be the next big thing in the entertainment industry. However, it hasn’t been a widespread idea because of the limited resource and content available despite the excitement it can bring. As mentioned, VR technology has been available for a few years, yet the content is limited. VR is still considered a niche product; not too many people have it and not too many industry or company uses it. I would not think VR in entertainment will be a fail, but I do believe that the movement or spread of VR in entertainment industry will be slow. I see the VR industry as still in the “early adopters” phase and that’s why I think mass adoption has not occurred, the technology just is not there yet for the general public. As you mention from the article, the “chicken and the egg” comparison is very apt for the industry, and Disney deciding to make content for this industry has the potential to help move the industry to the next phase of adoption. If implemented and designed well VR will be another way to consume entertainment, but if those things do not happen, VR will be seen as gimmicky and will never see mass adoption from the general consumer. VR will be seen in a similar way as the 3D TVs from a few years ago that were supposed to be “the next big thing” and consumers just did not see the value in the feature. Virtual reality can be a big thing indeed. However, there is unlikely to be explosive or widespread adoption without the necessary changes in the surrounding entertainment ecosystem. – Social: friends and families with whom you share the joy in their presence and discuss movies before and after the show. – Food: lunch or dinner after the movie, and snacks in the middle. – Cinema: the dark room with a social atmosphere. The home cinema scene also has certain requirements. – Sound: surround sound that matches the work, usually provided by the cinema or good home system. Content is wonderful, but mass-adoption of VR requires the convergence of all the pieces within the entertainment experience: from technology (one cannot maintain attention for a long time without inducing discomfort) to social context (people don’t enjoy movies solely in solitude). It may develop into a great niche within the streaming business, but widespread adoption in the scope and scale of Disney’s mainstream is unlikely until other changes have taken place. However, Disney can certainly integrate VR into its parks and recreation business, which thrives on novelty and new ideas. I do think VR has the potential to be the next breakthrough technology, but I believe it’s too early in the development timeline of the technology for widespread use. Other than a few big-name players, companies have not yet invested in providing quality VR content to their consumers, which has caused a stagnant demand for the technology. 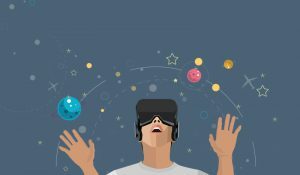 Until companies develop VR products that the majority of consumers are willing to use, VR will remain a niche technology with specific use cases. I think Disney is in a good position to invest in and experiment with VR. They definitely have the resources to make a product to spark demand, and if they don’t succeed with a consumer product they can implement VR into rides at their many theme parks. Imagine the potential for a Star Wars or Marvel inspired VR ride. I think this is a very interesting look at VR technology. I do agree that a lack of content is a big reason why adoption hasn’t been so widespread, but I also believe there’s a cost factor. While prices are going down, they’re still not at the point where the average American would see it as worth investing in. To take smartphones as an example, they did originally start out at a very high price, but they at least had many more applications than VR currently does. It’s also entirely anecdotal, but I’ve seen some stigma attached to using VR technology. Just watch someone use VR in a room by themselves to see what I mean. I could also see that having an impact on consumer adoption as well.